Up a narrow winding stair, such as are numerous in Lyon or in the wynds and closes of the old town of Edinburgh, and into a room where there are four looms; one idle, three at work. A wan thin eager-eyed man, weaving in his shirt and trousers, stops the jarring of his loom. He is the master of the place. not an Irishman himself, but of Irish descent. “Good day!” Passing his hand over his rough chin, and feeling his lean throat. “Yes. Every time I throw the shuttle, I cut out this wire, as you see, and put it in again – so!” Jarring and clashing at the loom, and glancing at us with his eager eyes. “Very slow.” With a hard dry cough, and the glance. “Very hard.” With the cough again. “Yes. This is. So is that one there;” the idle one. Again his loom clashes and jars, and he leans forward over his toil. In the window by him, is a singing bird in a little cage, which trolls its song, and seems to think the loom an instrument of music. The window, tightly closed, commands a maze of chimney pots, and tiles, and gables. Among them, the ineffectual sun, faintly contending with the rain and the mist, is going down. A yellow ray of light crossing the weaver’s eager eyes and hollow white face, makes a shape something like a pike-head on the floor. The room is unwholesome, close, and dirty. Through one part of it the staircase comes up in a bulk, and roughly partitions off a corner. In that corner are the bedstead and the fireplace, a table, a chair or two, a kettle, a tub of water, a little crockery. The looms claim all the superior space and have it. Like grim enchanters who provide the family with their scant food, they must be propitiated with the best accommodation. They bestride the room, and pitilessly squeeze the children – this heavy, watery-headed baby carried in the arms of its staggering little brother, for example – into corners. The children sleep at night between the legs of the monsters, who deafen their first cries with their whirr and rattle, and who roar the same tune to them when they die. Come to the mother’s loom. She looks up, quite bright about it – has a mother’s pride in it – is not ashamed of the name: she, working for her bread, not begging it – not in the least. She has stopped her loom for the moment. So has her husband. So has the young man. To which, the clash and jar of three looms – the wife’s the husband’s and the young man’s, as they go again – make a chorus. Good Heaven, is the house falling? Is there an earthquake in Spitalfields! Has a volcano burst out in the heart of London! What is this appalling rush and tremble? It is only the railroad. The arches of the railroad span the house; the wires of the electric telegraph stretch over the confined scene of his daily life; the engines fly past him on their errands, and outstrip the birds; and what can the man of usage hope for, but to be overthrown and flung into oblivion! There, we leave him in the dark, about to kindle at the poor fire the lamp that hangs upon his loom, to help him on his labouring way into the night. The sun has gone down, the reflection has vanished from the floor. There is nothing in the gloom but his eager eyes, made hungrier by the sight of our small present; the dark shapes of his fellow-workers mingled with their stopped looms; the mute bird in its little cage, duskily expressed against the window; and the watery- headed baby crooning a in a corner God knows where. In “Household Words”, this interview followed directly from Dickens’ account of the ostentatious affluence of the silk buyer and the immense financial turnover of the silk warehouse, upon the previous pages. By strategically placing these accounts of the different components of the silk industry side by side, Dickens presents his readers with the impoverished weavers, who actually produce the cloth, uneasily contrasted with those who profit handsomely through trading the fruit of their labours. The reader is invited to draw their own conclusion upon the inequalities of the textile industry, a trade in which injustice persists. Except today, rather than being on the other side of the city from the privileged customer, the workers are likely to be on the other side of the world. Next time, in the final installment of Dickens’ article, we shall accompany him on a visit to the studio of a young British artist in Spitalfields. The rare photograph at the top shows a Spitalfields weaver’s workshop, taken in June 1885. Both illustrations were kindly provided by the Tower Hamlets Local History Collection. of the characters from Dickens time ‘ghosting’ in the faces of people rushing about their business, only the clothes are different, the people don’t seem to change. I am haunted by it. I have especially enjoyed this article about the Weavers in Spitalfields. I have been interested to learn about my ancesters for over 30years now and not so long ago found the name Agombar (at first I saw it as Acamba) and have since found the name originating from France and a relation was a Silk Weaver around the corner from Brick Lane. What hard times it must have been for my ancestors. But this article was very interesting and gave me a small insight into what it most probably was like for the families. Like Kim, I too had ancestors who lived and worked as Silk Weavers in Spitalfields. Their lives must have been so difficult, but interestingly, it never stopped them having children, and my ancestors had at least 8 each!! Thanks for this article and these drawings, it does help visualize how they both lived and worked. Facinating. So very interesting as I have discovered my husbands ancestors were silk weavers and loom brokers “around the corner from Brick Lane” in Sclater St. I managed to trace them back to 1800. 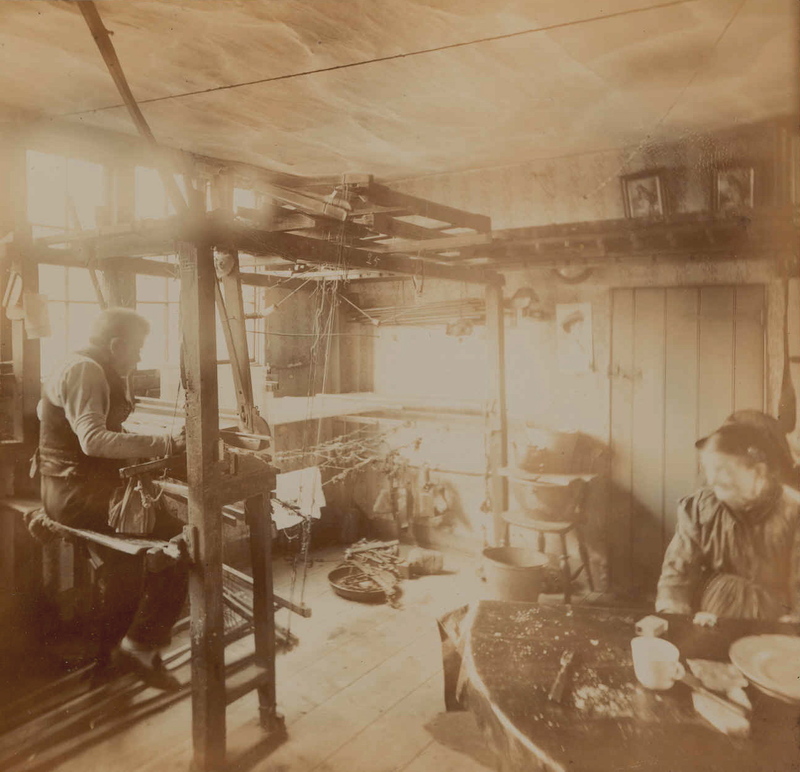 By the 1870′s they were box makers and printers .The photo has given me a better picture of living/working conditions at that time. Thank you. how very proud you must be to bring so much delight to so many of us, and to help folk learn about their ancestors! Once again, thank you for this totally brilliant blog. I eagerly await it’s daily arrival in my inbox. I found the article Dickens wrote a very interesting posting. We have been searching for information about Thomas Cross, a weaver of St. Leonard’s. We have no way of knowing what happened to him, nor what class he was in. 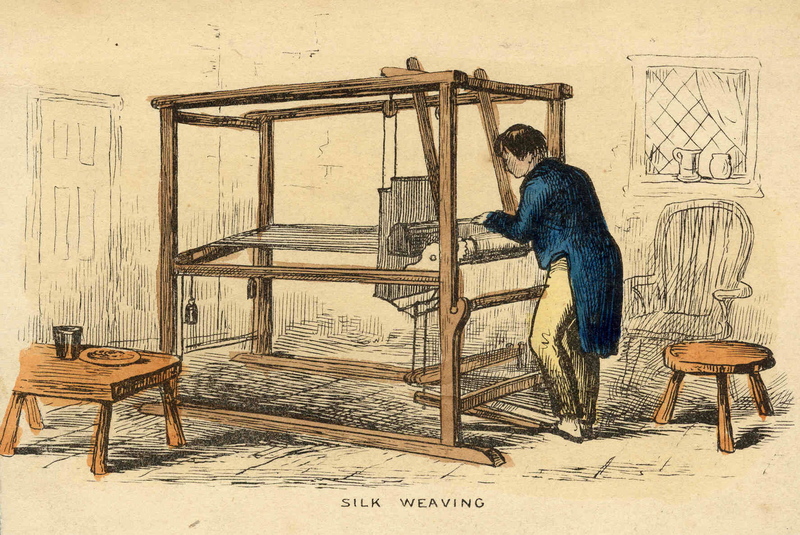 He lived in the 1700′s so presume he may have been one of these hard-working weavers Dickens described. Is there a list anywhere of weaver’s names? The only information I have gotten is posted for pressers and packers of cloth, as this is what two sons apprenticed for. I would like to know as well if one can read the other two installments! Dickens, so amusing and astute….thanks for posting it. my ancestors were silk weavers in the east end, how do i get a copy of that fabuloius photo? My Huguenot Jean Rondeau family lived and wove on Brick Lane, and worshiped at Christ Church Spitalfields. In the 1830, my William Rondeau immigrated to Livingston Co, Kentucky, and became a backwoods preacher. William’s sister, Phoebe Rondeau, was not impressed with the frontier on the Ohio River, and moved on to Oakville, Ontario. I am always glad to see things on the Spitalfields area. It makes my family research much more interesting. Every morning, I enjoy a new “family” chat. Howdy from Tucson, Arizona. re the note from “frost” 23 Feb 13. If you find any records, I would love to know how to access them. My grandmother’s family were “Harper”, and although I believe they were in the market, I would love to know if any of them I don’t know of where weavers, or anything about any of them. I love all these photos and write-ups. I will read this with interest. I blog on beer history (mostly) and thought this posting from last July would interest you given your Spitalfields focus: http://www.beeretseq.com/spitalfields-weavers-originated-the-terms-three-threads-and-porter/ The post following it develops the theory further. In a nutshell, I advance a completely original theory, that the term “porter” meaning the black/dark brown beer which originated c. 1720 in London, as well as the term for a predecessor beer, “three threads”, originate in Spitalfields silk weaving terminology. The theory is a little complex, but three threads (and certain thread multiples, e.g., six threads), and “portee” which derives from the French for opening (door), were terms from the loom to measure cloth quality, not just for silk. I theorize that these terms were applied to different qualities of beers using brown malts to make them quite dark-looking. Generally people have thought porter comes from the London porter-trade because it is known that porters who moved goods liked the black beers, but I think that is an incorrect theory. Those are the two key ones (the ones before these two were “gestation” pieces, and should be disregarded). Thanks again and hope it is of interest to you given your extensive and vital work on Spitalfields history.